President of Ukraine Petro Poroshenko and German Federal Chancellor Angela Merkel at a meeting in Davos discussed cybersecurity issues in the upcoming presidential elections in the context of possible Russian intervention. 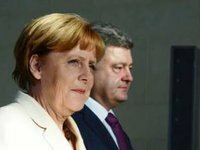 According to the presidential press-service, Poroshenko in an interview with Ukraine TV channel spoke about some details of the meeting with Angela Merkel on preventing Russia's interference in the elections: "It's about cyber security, the exchange of data ... ," he noted. At the same time, he stressed that he could not reveal the content of the agreements on the special services and all the mechanisms for providing cyber security. "It is obvious that we will not disclose the details of these agreements," the president emphasized. He reminded that the NATO Trust Fund for cyber security had been created at the Ukrainian initiative, as well as there were specific bilateral agreements with the United States, Great Britain and Germany. "Today, it is very important that the United States, the EU and Canada consider it a real threat. It's not about helping Ukraine, it's about uniting efforts to protect democracy around the world. Because Russia is trying to use democratic instruments and mechanisms to undermine democracy from the inside. Of course, we will defend the state, including from such hybrid threats of Russia," he stressed. Speaking generally about meetings and talks in Davos, the president noted that international partners support Ukraine and demonstrate the position of protecting Ukrainians. The presidential press service said that that during the two days of Poroshenko's visit to Davos, about 20 official meetings had taken place.